43 photos of Brunel's revolutionary steamship, the first built of iron and the first powered by a propellor. When launched at Bristol in 1843 she was the biggest ship in the world. She was designed for the North Atlantic, but spent most of her career on the Australia run. In 1886 storm damage forced her into Port Stanley in the Falkland Islands, and there she remained as a hulk until 1970 when she was returned to Bristol. There are also photos of other historic Bristol ships, including the replica of Matthew in which John Cabot discovered Newfoundland in 1497. Welcome to Brunel's SS Great Britain! Bristol, Tues 4 September 2012 1. Brunel's revolutionary steamship was the first built of iron and the first powered by a propellor. When launched at Bristol in 1843 she was the biggest ship in the world. She was designed for the North Atlantic, but spent most of her career on the Australia run. 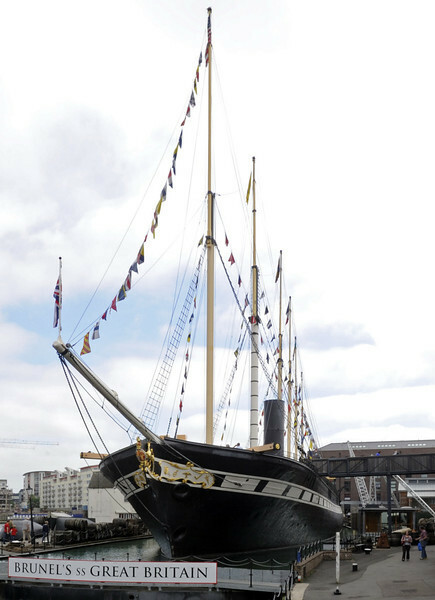 In 1886 storm damage forced her into Port Stanley in the Falkland Islands, and there she remained as a hulk until 1970 when she was returned to Bristol.